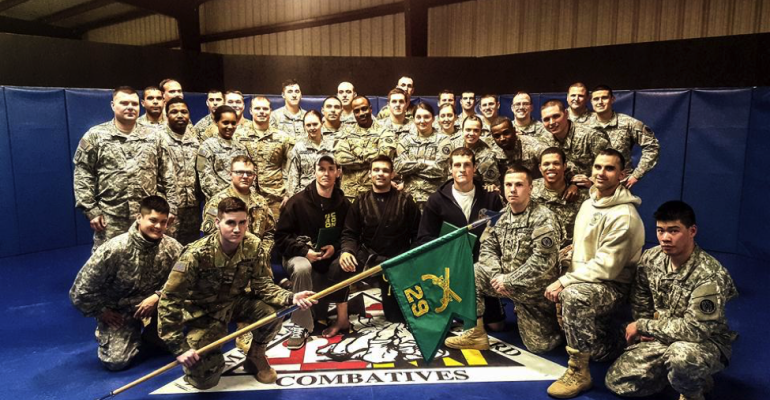 On March 22nd, Ground Control Columbia’s Joao Paulo and Bryce Garipay, along with Ground Control Owings Mills Head Instructor Ryan Makin, trained with the Maryland Army National Guard 29th Military Police Company at Camp Fretterd. The training session ran from 10:00am to 3:00pm where over the course of the day the company was taught some basic Brazilian Jiu Jitsu, Wrestling, and Self Defense tactics that they can use in conjunction with the skills the already know. They finished the day with some live grappling, where they got to show off their new found techniques on our instructors and finally on each other. We would like to extend a very special thank you for making all of this possible to Sergeant, B.J. Randall (GCC Member) and allowing us access to their facility and work with the great Men and Women of the 29th Military Police Company. Lastly, the Ground Control family would like to thank the Maryland National Guard’s 29th Military Police Company for allowing us the opportunity to train with them for the day, this was definitely an experience that we will not soon forget and we wish all of them the best of luck. The Company is preparing to go to Cuba this upcoming August to guard the detainees at Guantanamo Bay.